I’ve always been creative and artistic and would use my imagination wherever I could for Halloween parties making huge spiders webs out of coloured wool, glass painting doors and windows, selling animal painted glass for conservation charities. But it was the unexpected opportunity, following chronic illness, to return late in my career to my childhood passions, and to be able to draw them together for the first time to create a story that inspired me to give writing a go. A lifelong passion for reading, illustration, history and animals was a good foundation for world building, as are our armed forces and an unfulfilled dream to fly harrier jump jets. Wildlife from earwigs to elephants and my rescued street animals are at the heart of all my writing. They are my passion and I wanted to give them a voice so that readers can come to understand animals and their language better (in this case talking dragons) their unconditional companionship, love and loyalty, their empathy and their ability to heal people who are wounded or lonely or traumatised. Native American’s culture has inspired me since childhood; and I have drawn upon the guidance of their animal and bird totems, naming ceremonies and moons, and their culture’s affinity with and respect for mother earth and all her myriad creatures. I have adopted two Navajo Native Elders, a lifeline for Native American’s struggling to survive in Arizona. I wanted to create a feisty female protagonist who young readers could easily engage with even in an unfamiliar magical world, but one who came from an aristocratic family rather than the classic rags to riches. I wanted her to be used to having her way, but also, despite being the daughter of the Commander of the Stealth Dragon Services, a rebel who doesn’t fit in, who is lonely, bullied, who desperately wants to fly Imperial Black stealth dragons at her father’s side in the Stealth Dragon Services (SDS inspired by our Special Air Services) when young ladies should be learning etiguette, deportment, and how to acquire a husband. She prefers battles over boys and dragons over dresses. 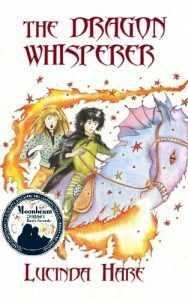 In The Dragon Whisperer only readers know her power is that she can talk to dragons, but nobody in the story believes her, putting it down to childhood imagination. I largely based her character on myself at the same age. Root, who is so many reader’s favourite is a gnome orphaned by the war, alone, frightened, a commoner, and the last thing he needs is to be chosen as Quenelda’s esquire, normally that honour is given to a younger son of a noble house. Not only does it break all the rules of etiquette but on the top of that he hates dragons, let alone battledragons. Gnomes are a nomadic, peaceful race who will not bear arms, and don’t kill animals for food or clothing. They live off the land (inspired by Native American culture). Root’s father was a scout to the SDS Commander, Quenelda’s father, and it is in memory of his sacrifice that the Earl promotes Root to esquire his daughter. Quenelda has out flown all her esquires, humiliating them, but the Earl tasks his wayward daughter with teaching Root herself. If she wants to attend the Winter Jousts she has to succeed. He has cleverly trapped her and hopes she will learn a few lessons along the way. Quenelda and Root are mentored by the dwarf Tangnost Bearhugger, a gruff old veteran BoneCracker Commando who is Dragon Master to the Earl and a second father to those under his charge. He trains Dragonsdome's dragons and teaches esquires how to fly and fight with them. I found inspiration for him from the actor Edward James Olmos's character in Battlestar Galactica. My other characters are inspired by my love of animals and in particular by my own large rescued furry family. You meet Two Gulps & You’re Gone at the very beginning of The Dragon Whisperer. He is big red-gold sabretooth battledragon with a broken tail. Highly strung and unpredictable they can normally only be handled by their riders, but Quenelda with her unique skill can talk to any dragon. His character is based on my rescued cat Rufus who had oodles of cattitude. Stormcracker Thundercloud III is a massive Imperial Black and the Earl’s stealth battledragon. And finally, for Root I had to introduce a gentle domestic dragon named Chasing the Stars, who has a wicked sense of humour and helps him overcome his fear of dragons and flying. She is inspired by a number of my cats including Chinook. Just to give you an idea of where inspiration can randomly come from when creating characters if you look out for it. I had virtually written a draft of The Dragon Whisperer and was still searching for that elusive name for my feisty female protagonist. I wanted a name that would suit the daughter of an old aristocratic family, but was sufficiently rare that it would help me to 'world build'. What happened? Well, it is an intriguing story in itself. I am a newsaholic: BBC News 24 is permanently on in the background. I was passing by when I heard the mention of a polar explorer Tom Avery who led a pioneering British expedition to a previously unexplored 20-mile mountain range close to China's western border. I love watching Arctic and Antarctic exploration, but for once this was not a polar challenge; his team had scaled nine uncharted summits up to 6,000 meters high in the Eastern Zaalay Mountains of Kyrgyzstan. If you are the first to scale a mountain peak the honour of naming it falls to you. Tom had named one of the mountains (the 5439m Pik Quenelda) after his mother, whose birthday fell on the day the team reached the summit. It was his mother who was being interviewed about the 2005 Barclays Capital Ultimate North Expedition that aimed to solve the greatest polar mystery of all time: did Commander Robert Peary discover the North Pole in 1909 in a record 37 days. I stopped to listen, and the moment I heard her voice and saw the name Quenelda Avery, I knew I had my heroine. A year or so later I got an email out of the blue from a London lawyer asking me where I had come across this most unusual name. He had been shopping for a Christmas present for his mother and had come upon The Dragon Whisperer. I told him, and he replied that was his mother and brother! Since then Quenelda and I have corresponded. She can track her ancestry all the way back to 1066 and beyond to Scandinavia, the true origin of the name. Three of her grandchildren have Quenelda as a middle name. But that is not the end of this tale! Quenelda's father's coat of arms bears a dragon! It makes you think! Root sighed. These were just lifeless words – they didn’t convey the breathtaking, heart-thumping reality of a battledragon. He reached for his satchel and pulled out half a dozen barkscrolls, rolling out the largest and weighing it down with his plate and leather mug. The Sabretooth leaped at him out of the drawing: the power, the ferocity, the huge hind legs that made the ground shake, tipped by talons honed to a wicked edge, the great jaws . . .
‘Come with me,’ Quenelda commanded briskly. She was dressed in heavy blue leathers and full flying harness. She threw a training helmet at him. Hands stinging with the impact, he just managed to catch it before it landed in his lunch. He looked up at her in confusion. Her next words spurred his heart into a terrified gallop. ‘We’re going flying.’ She turned for the door without waiting to see if he was following. Root wished Quester was with him – his friend would have told him what to do, but he was in the training cage with the cage master. Out of the corner of his eye, Root could see Felix and his cronies watching with interest. Behind him he could hear Felix and his friends speculating loudly on the outcome of his first flight. ‘I know,’ Quenelda replied over her shoulder. ‘But at least you now know one end of a dragon from the other.’ She suddenly stopped at the inner paddock wall. Root cannoned into her and rebounded. ‘Ouf!’ He felt his face colouring as he scrambled to his feet. ‘The . . . the b-battledragon?’ Root’s heart now bolted completely out of control. He felt faint, spots swam in front of his eyes, his breath caught in his throat. He finally caught up with Quenelda in the tack room. A blast of hot air rolled out of the roosts, carrying the stench of sulphur. Root swayed on his feet. He thought he was going to faint. It was too much. No one had ever once asked Root if being an esquire was what he wanted. Not Tangnost, not the Earl, and certainly not Quenelda. He stood there for a moment, emotions swirling around his head, fighting the tears that stung his eyes. His whole world had been turned upside down. His father was dead. The esquires constantly mocked him. Quenelda didn’t want him – she was making that perfectly clear. He angrily wiped his tears away. Well, it couldn’t get much worse, could it? Quenelda stared at him, open-mouthed. He gazed back, horrified that he’d said too much, certain that he would find himself dismissed, thrown out on the streets. But Quenelda was stunned. No commoner had ever spoken to her like that before. As an earl’s daughter, she was used to being obeyed without question. She stared at the pale-faced gnome as if he were a total stranger. This was a side of him she had not seen. With a guilty pang she realized she was stupid not to have acknowledged his acute fear of dragons; in her desperation to get back to Open Sky she had simply ignored it. And she had to admit that he had made an effort. He had persisted in spite of provocation and prejudice, hers included. He had got back on the wooden dragon in the face of the humiliation and mockery – which, if she had not exactly encouraged, she certainly hadn’t stopped. He had struggled against the odds despite his loneliness. Despite the fact he didn’t fit in . . .
Quenelda paused. He didn’t fit in. Just like she didn’t fit in! The sudden realization hit her like a hammer blow. How many times had she been mocked for her love of dragons, for her passion for flying? How often had she heard the snide gossip and unkind whispers speculating about the identity of her mother? Her own petulant words to her father came back to her: But I don’t want to be a young lady! I’d hate it at court. I want to fly dragons! She hated dresses and ceremony, the stifling formality of court. She flew dragons when no other girl did. And she wanted to apply to Dragon Isle. Some of her exercises with the senior squires had shown that some of them, if not all, didn’t think girls could or should be allowed to. And now that she took the time to look properly, she noticed that the gnome was as thin as a runner bean, all sharp elbows and knees, and his once chubby face had an unhealthy, gaunt look to it. He was still grieving for his father. She remembered her fear when her father had collapsed. What if he never came home? Fear suddenly made her knees weak. She sat down heavily on a bench. Embarrassed, Quenelda closed her mouth, which was still hanging open, and opened it again to say something. She glanced up. Root was staring down at his scuffed boots. She followed his gaze and saw that the stitching was coming apart so that the toes on his left foot were sticking out. And he was shivering, whether from fear or cold she couldn’t tell. Maybe both: his thin clothes were hopeless for anything but Lower Sky flying in summer. ‘No. I’m sorry,’ Quenelda heard herself saying determinedly, her ears pink with shame at her arrogant behaviour. ‘I’m sorry. Really.’ She nodded, reaching a tentative hand out to touch his shoulder and pull him down on the bench beside her. Quenelda glared at her blue-buckled flying boots, suddenly looking very young. Root gawked at her. Was she going to cry? She raised her head and smiled oddly, torn between pride and bitterness. The young gnome stared at her. Quenelda sighed. She had never divulged this to anyone – not that she had anyone to share secrets with except for her dragons – that was the point. But in the midst of the hustle and bustle of Dragonsdome, she was often lonely. ‘None of the girls want to go anywhere near dragons – they think I’m peculiar. They’re obsessed with clothes and court gossip. Sometimes gossip about me . . .’ Quenelda paused, remembering how she had questioned her father about who her mother was. ‘Papa told me I couldn’t take to the Open Sky until I had taught you how to fly.’ She coloured as Root’s eyes widened with sudden understanding. ‘With him being away at the war more and more, I’m just used to being on my own.’ As she said the words, she remembered what her father had told her: that Root too was on his own. He really was on his own. A shiver of sadness ghosted over her skin. Root stared at her. Had she really apologized? His oak-dark eyes fixed on her in sudden hope. Root managed a nod. His hands were shaking. He thought he might be sick. Root nodded mindlessly and pulled a pair of boots two sizes too large and shrugged on a warm cloak. They walked along the great tree-lined avenue between endless rows of paddocks, boot buckles cheerfully jingling. Past the unicorn stables and on to where the air was alive with glorious colours as griffins, hippogriffs and dragons wheeled and dived and swooped through the crisp afternoon air, roosting on trees and poles. The great hive-shaped roosts and terracotta-tiled stables stretched out in front of them. Every now and then Quenelda would stop to consider a dragon, pointing out its particular pedigree and characteristics to Root. He walked rigidly along beside her, eyes straight ahead, nodding automatically. ‘Mmm.’ Root remained unconvinced. A nerve in his jaw was twitching madly, giving him a demented look. One dragon looked pretty much like another to him; a variable assortment of claws, wings, scales and a double helping of teeth. He couldn’t even always tell a herbivore from a carnivore. By the time he made his mind up, he would probably be dinner! Unable to keep silent now that she’d opened up, Quenelda maintained a running commentary as they went. Climbing over the paddock gate, Quenelda considered the dragons, dismissing first one breed, then another, trying to find one that might not frighten Root. She looked at Root’s taut face and white knuckles where he gripped the gate. ‘Mm?’ Root nodded mindlessly. He wasn’t taking in a single word. Chasing the Stars . . . she whispered. The small dragon immediately leaped across the intervening space in two wing-assisted bounds. May the wind sing under your wings, Chasing the Stars. Quenelda smiled her welcome as Root instinctively stepped backwards. As she had promised, the dragon was no larger than a big horse, but to Root’s eyes she was impossibly huge. A long climb up and an even longer fall – and, given his track record on the wooden dragon, the fall was a certainty. And may the stars guide your path, Dancing with Dragons . . . The magenta-blue mare returned Quenelda’s formal greeting. She turned her dark, intelligent eyes onto Root, who stuck out his chin and chest and tried to look unconcerned. The young Wingless One is afraid of me, Chasing the Stars observed as she bent her slender neck to nuzzle the girl affectionately. I can see his knees knocking. He’s never flown before and he’s afraid of dragons. He’s never flown with Dragonkind? Chasing the Stars was amused. Then he hasn’t lived. I can show him how to chase the clouds, to dance with the stars . . . In time perhaps, Quenelda conceded. But not today. Today we must fly slow and low. As you say, Dancing with Dragons, so it shall be. Root nodded miserably. As Quenelda left, he tried to whistle but found he couldn’t summon up a single peep; his mouth was too dry. Hooking his thumbs casually into his belt, he pretended to study a large stag beetle making its way through the grass, then glanced up at Chasing the Stars. ‘N-nice d-dragon,’ he ventured hopefully. The mare considered Root with deep lavender eyes framed by long eyelashes, before turning to groom herself with her long delicate snout. Root stood horrified as the dragon yawned luxuriously, baring her teeth and a long pink tongue that disappeared into her even longer throat. Seemingly ignoring him, she slowly stretched out her wings, then inspected her wing-thumb talons, all four of them. The gnome watched, swaying slightly, almost hypnotized by her languid movements. Then, with no warning at all, the dragon’s head whipped down to where he stood. Greetings, little Wingless One . . .
Root couldn’t hear the dragon speak, but he felt the delicate whisper of her breath. She suddenly grinned at him, baring a row of large molars barely inches from his nose. Her breath bloomed hot and damp on his face. She fluttered her luxurious eyelashes invitingly at him, tickling his cheek. Rigid with fear, Root quivered from head to toe. His own eyelashes fluttered for entirely different reasons. His eyes swam in their sockets. Then, with an almost inaudible squeak, he keeled over backwards. Over on the other side of the paddocks, a group of esquires hooted and jeered. ‘Fallen in love with a dragon, then?’ Felix bellowed as the dragon licked Root’s face. ‘Fainting at her feet?’ Their loud guffaws brought Quenelda hurrying out of the tack room. ‘Oh, Chasing the Stars,’ she rebuked the dragon. ‘What have you done to him?’ But she was grinning as she bent over the gnome. ‘Root? Root?’ She took his hand and tried to shoulder Chasing the Stars’ solicitous muzzle aside. ‘Ooohh . . .’ Root’s eyelids fluttered. Something wet, rough and heavy was rasping his skin. He opened one streaming eye. A lavender oval iris filled his sight. He put up his hands to fight it off, slapping at the long muzzle. ‘Oh . . .’ Root felt vaguely embarrassed. He couldn’t imagine how he could hurt such a great creature. ‘Sorry,’ he said awkwardly, raising himself onto his elbows. He wasn’t sure if he was apologizing to Quenelda or the dragon. He allowed the girl to help him to his feet. She looked at him thoughtfully, keeping a firm grip of his hand. ‘Trust me.’ Quenelda took his reluctant hand and placed it firmly on the dragon’s hide. ‘They’re not all the same’ – Quenelda shrugged as she tried to find the right words – ‘any more than we are. That’s what I’ve been trying to tell you. Some dragons are armour-plated or ridged and pebbled like lizards or scaled like snakes. Others, like Chasing the Stars, are leathery or grainy-skinned like wood or even hard as stone. A few are feathered or furred like griffins and hippogriffs. Each breed is different. Root hesitantly held out a couple in his shaking hand. The dragon’s tongue snaked out and took them before he had time to grab it back. In a twitch the tablets were all gone and the long pink tongue was probing for more, its tickling forked tips curling around his fingers, searching up his sleeve then inside his cloak, seeking out pockets. With a smile, Quenelda slung him a small fodder-sack. Chasing the Stars munched contentedly and turned to nose at her. He is gurgling like a babe. I know. Quenelda smothered her own grin at the broad smile plastered on Root’s face. Now let us both introduce him to flying. ‘Kneel,’ she asked the dragon, signalling with her hand so that Root could see what to do. Mounting the dragon’s bent foreleg, she threw the saddle over her back and swiftly buckled it up. She tightened the girth straps and beckoned Root over. ‘You must always make sure the girths are tight,’ she reminded him. ‘What are—?’ Root was too nervous to remember any of his training. He was feeling slightly sick again. ‘And I fall off and die,’ Root completed her sentence gloomily. Bending her front legs, Chasing the Stars half knelt down once again, head turned to watch the gnome’s progress. Root sat there, squirming, his short legs sticking out at ridiculous angles on the broad-backed dragon. The stirrups were so far out of sight he could barely see them. Root nodded cautiously, not trusting himself to speak. How was it supposed to feel? Mounting might be all right but, unlike its wooden counterpart, this dragon was breathing, its deep ribcage rising and falling beneath him. His heart felt as if it was about to burst, and his knees were knocking against the saddle. Root closed his eyes, feeling sick with fear. He could feel the dragon’s hind legs gathering beneath him for take-off, the whisper of her wings as she spread them. This was something the lifeless wooden dragon couldn’t prepare him for. He gripped the pommel with all his might, and then he felt the dragon launching herself into the air. Quenelda kept her word. They flew so low that the dragon’s wings brushed the wet bracken, her undulating tail powering her over fences, in between trees, braking, stalling, climbing, banking this way, then that. Root rapidly found out that height wasn’t his main problem. Up . . . down . . . the dragon’s leathery wings flapped. Rising . . . falling . . . rising . . . falling . . . The world wouldn’t stop moving. He bounced in the saddle. The upward and downward motion was making him decidedly travel sick. It was as if his entire body was aware of the dragon’s wing beat and nothing else. Even his heart appeared to beat to that rhythm. He watched the tendons that supported the leathery wings ripple beneath smooth skin as they swept around the great metal ribs of the training cage. There were whoops of encouragement from inside the great glass and iron cage as Quester and a group of esquires spotted their low-level flight. Root plastered a sickly grin on his face and tried to straighten up and wave, and then they were past and he sagged miserably in the saddle. Unused to flying, he was already tiring with the effort of hanging on. His muscles were aching, burning. Sweat broke out on his forehead. His stomach was trying to tell him it wasn’t happy. He burped. He felt clammy. Far from easing, his breathing grew ever more ragged. Eyes half closed, he swayed in the saddle. Up . . . down. His pallor changed from red to chalk with a faint hint of green. He burped and put a hand to his chest. Up . . . down . . . He is burping like a babe – Chasing the Stars’ laughter sounded in Quenelda’s head. The dragon’s ribcage vibrated beneath Root, making his toes tingle. Up . . . down . . .
With a flood of self-pity, Root realized he was about to embarrass himself. Snatching up the bowl so thoughtfully provided by Tangnost, he surrendered his breakfast and his dignity.